SuperWall SSG for four-side silicone-glazed curtainwall and window wall systems is available in four depths: 6-3/4, 7-3/4, 8-3/4 and 10-3/4 inches and accepts standard, structural silicone, insulating glass units. 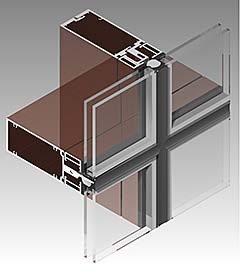 Narrow 2-1/2-inch mullions are matched by inside and outside 90-degree corner profiles. Framing can accommodate zero sightline insert vents, exterior sun shades and interior light shelves, and façade-integrated photovoltaic modules.